DC's returnable Rebirth titles led the charts; ten of the eleven books over 100,000 copies were DCs. Given the 10% reductions Diamond preemptively makes for returnability, odds are there really were 15 titles in six figures. 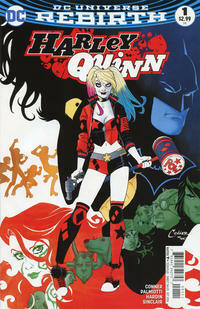 Harley Quinn #1 was #1 with nearly 360,000 comics shipped; that comes in just behind Marvel's Civil War II #1 as the year's single-month best-seller, but again, given the reduction, it's really more likely that the number of Harley copies shipped to North American retailers was around 396,000, making it the year's leader. We'll see where things shake out with the end of year report in January. As noted, this release completes twenty years of my doing monthly Direct Market sales reports. That's 240 months' worth — that math's easy to do — comprising sales reports for more than 136,000 comic books and graphic novels sold since September 1996. That's more than one and a half billion comics that Diamond shipped — and a billion dollars' worth of graphic novels accounted for. The real accomplishment, of course, is the industry's: it's the work of the publishers, Diamond, and retailers for moving all those copies. Still, it is for me a personal milestone. I've done some form of pre-publication cleanup and analytical work on almost all of those entries, and the calculations and presentation add up to something like a thousand hours, or about six weeks of my life, day and night. 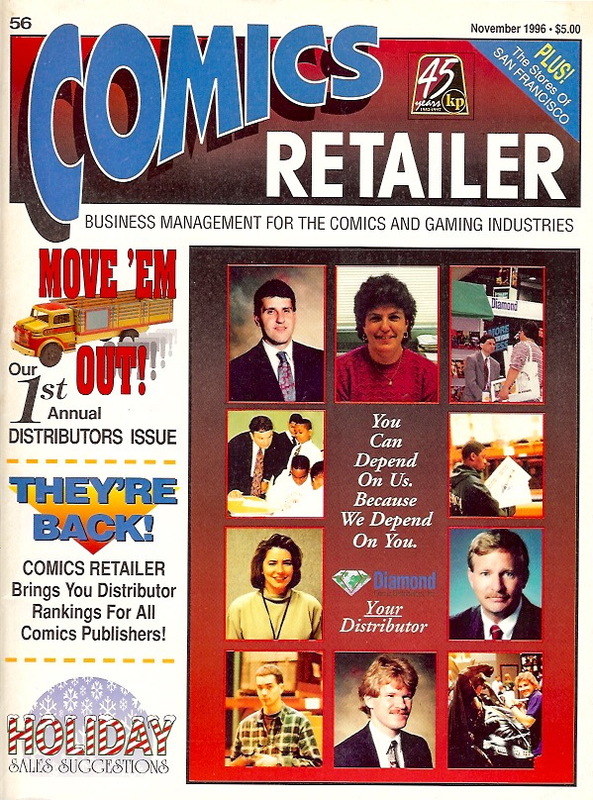 And I continued it long after I was no longer associated with the magazine where they were first published, Comics Retailer (later Comics & Games Retailer). I've worked on the reports in hotel rooms and airports — wherever I happened to be when they became available. This month's report was particularly challenging, as I was amid a press junket for my new Star Trek novel trilogy. A lot of work's been done at 1 a.m. over the years, cleaning up the entries — which appear in all caps in Diamond's reports — as well as figuring out what publisher names go with the three-letter codes they get in the Diamond releases. And that's all before any math! Clearly, I thought it was worth doing. Explaining why takes us on a trip through how the figures came to exist in the first place. 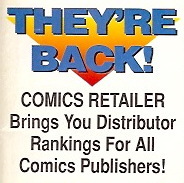 Prior to the early 1980s, the only public comics sales charts including actual numbers had appeared in fanzine articles collecting postal Statements of Ownership from the comics themselves. These, of course, reported only annual averages — and only took into account comics sold by subscription. 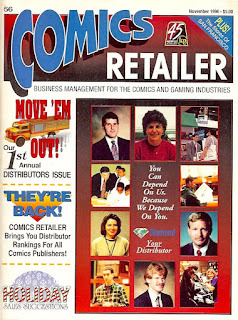 There were, in The Comics Reader and later in Amazing Heroes, attempts to come at it from the other direction by surveying retailers; I began doing this in 1994 in Comics Retailer as "Market Beat," a column that continued until the publication's end. While I was able to generate average store sales for various titles with this, it was far from ideal — and such efforts did not speak to the number of copies in circulation. We began to get part of that picture in the early 1980s. Capital City Distribution was one of several Direct Market distributors operating in that period, having started in Madison, Wis. in the spring of 1980 with 17 retail accounts and a half-dozen vendors. Cofounder Milton Griepp began publishing monthly sales charts in the company's newsletter — later magazine — Internal Correspondence. Having visited Capital City's archives and later ICV2's archives, I have most of these — and while sales charts began appearing in the publication as early as February 1984, it's really what came along in October of that year that changed the game. Griepp did not include sales figures in his rankings; it's not clear that either Capital or the publishers themselves would have wanted to see those numbers publicized. Direct Market sales were still growing, and Capital was only a part of them; while today's Diamond sales figures are a pretty good picture of periodical sales overall, back then, no one distributor's sales would have painted a full picture. Instead, starting in October 1984 issue — the same one that included a full-page memorial for Direct Market founder Phil Seuling — Griepp published something which served a purpose for the retailers Capital worked with: "order index numbers." These were presented as a ratio of the sales of a key issue each month. Retailers could see that the average Capital customer preordered, say, 160 copies of Uncanny X-Men for every 100 copies of Amazing Spider-Man preordered. (The first month, Griepp used Secret Wars #10, the top seller, as the key issue.) That permitted retailers to make adjustments in their orders to bring them into line with national trends. If you were only ordering 12 copies of X-Men for every 10 copies of Spidey, you'd know X-Men probably had room to grow. This is a significant point: the monthly sales reports were never designed to be read by consumers. They were there to help retailers see larger trends. But because all the titles existed in mathematical relationship to one another thanks to the order index numbers, it became possible for anyone who knew the approximate real number of orders by the Direct Market of a single title to make an educated guess as to the sales of the others. The problem with the method, of course, was that because Capital only represented a chunk of the Direct Market — and a different portion of each publisher's sales, too — a certain amount of error was built in. For a while, DC's trade terms with Capital were inferior to those Marvel was offering, and in that time, Capital's share of DC's total copy count was smaller. 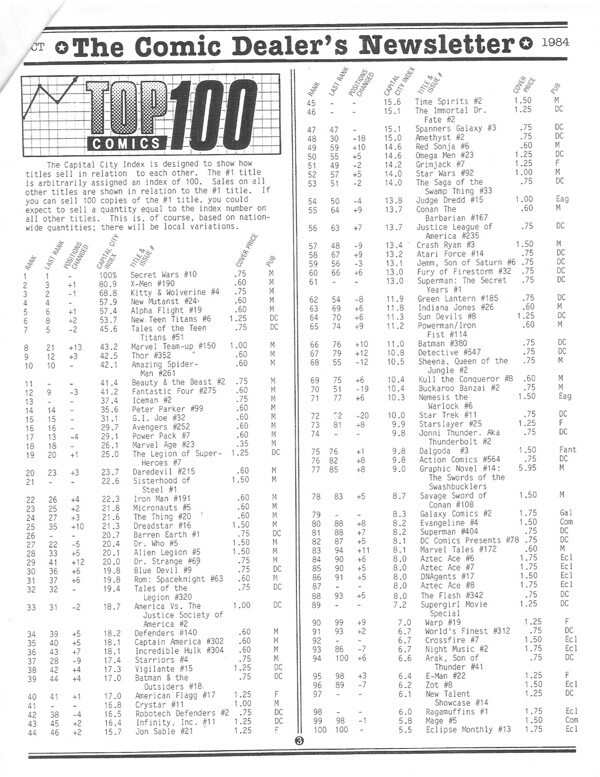 Capital appears to have represented about 11% of Marvel's total copies sold (including newsstand) in 1986, for example; its DC share was closer to 9%. Meanwhile its share of Kitchen Sink's sales in 1985 approached 23%. But a rough approximation was better than nothing. And because it worked with any title, the publishers themselves, large and small, could estimate what the rest of the field was doing. I know for a fact it was being done; in addition to talking to publishers before 1995 about their calculations for "the magic number" — the number of copies one point on Capital's chart equalled — I have also obtained internal spreadsheets and documents wherein various publishers unlocked the various monthly tables. 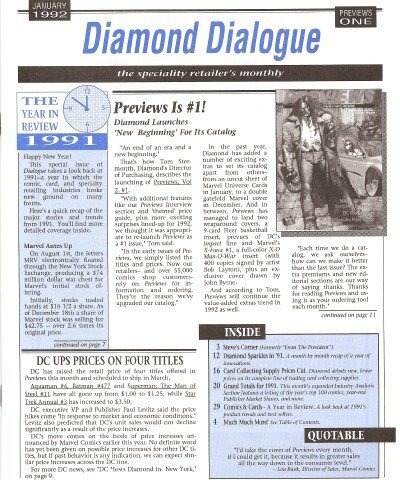 When Diamond created its own newsletter — which evolved into Diamond Dialogue magazine— it began running its own order index numbers, keyed to a different title but functioning effectively the same way. No other distributors I can find published indexed sales figures, but Capital and Diamond had together captured enough of the Direct Market by the early 1990s that a pretty good model of overall sales could be worked out using the tables of either distributor. The fact that their rankings tended to coincide pretty well likewise added reliability. And then... it all blew up. In December 1994, Marvel announced it had bought Heroes World Distribution, then a regional distributor and then the third largest Direct Market distributor. You can read more about that era here and here; it changed pretty much everything. 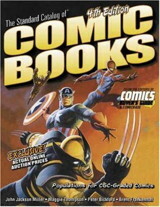 The intent of the purchase was to make Heroes' World the exclusive distributor of Marvel comics to shops, and by the following summer, that became a reality. Every other distributor lost the ability to distribute Marvel's books as of July 1995 — except for Capital, which through a legal settlement kept them through the end of August. DC, under pressure from its corporate parent to respond in kind, crafted a deal to make Diamond the exclusive broker of its books — and then it was off to the races, with Image, Dark Horse, and Acclaim signing similar deals with Diamond that summer and Capital signing up Kitchen Sink, Viz, and some smaller publishers. I joked at a panel the following year that I'd never seen so many college kids signing contracts outside of the NBA Draft. You can see a record of the moves here. Suddenly it was impossible for a retailer to get all the comics being published without accounts with three different distributors — and the charts and their order index numbers were of little use. Yes, Diamond's tables captured all Direct Market preorders for the publishers it carried — but it was missing Marvel and Capital's data. Capital continued with its own charts for a time making informed guesses about the titles it could not carry, but eventually those ended — and by the summer of 1996, Diamond bought out Capital. There had been, by that point, a full year with no single unified sales chart. Matthew High, then of Antarctic Press, had likely become the first person to post estimates online with a series of reports on Usenet in December 1995 — but those only included Diamond. And Marvel — which had moved to Heroes World in part so it would no longer have to share the promotional limelight with multiple other publishers — came to miss the value of seeing charts that, so often before, its titles had topped. With Marvel in bankruptcy and under new management, I found it was amenable to sharing information for publication in a unified set of charts in Comics Retailer. 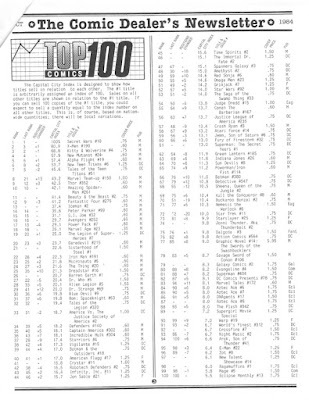 Armed with Heroes World's contribution — and the aid of a pool of publishers providing many data points to unlock Diamond's table — I published the first unified sales tables in over a year in a release covering September 1996's sales, just in time for Marvel's "Heroes Reborn" titles to launch. Jim Lee's Fantastic Four #1 was the first top seller on the charts; you can see all the #1s that followed here. Yes, that timing was no mistake; Marvel had a reason it wanted the charts back running around that time. But getting the unified tables back was of greater importance: from then until now, the spreadsheet files in my system have always been titled "Harmony." Besides, DC was topping the charts just two months later anyway with the wedding of Superman. By April 1997, when Marvel threw in the towel on Heroes World, the Diamond tables suddenly captured almost the entire comics preorder universe. But with the files already started and the industry still in a tailspin, I kept at it, hoping the information would be of some use to people in the trade. It turned out to be a longer-term commitment than I'd imagined! As noted above, the distributor sales estimates had never been intended for general consumption, beyond the order-index-number-free consumer versions that had appeared in Previews. 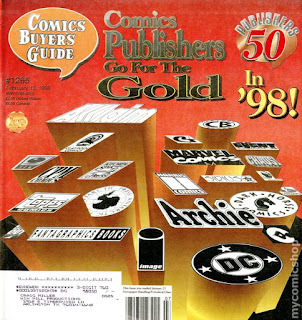 But the internet had changed that in the late 1990s, and with the market in decline, I was eager to make the most out of it, both in Comics Retailer and in Comics Buyer's Guide, its sister publication. It was novel having so much information to work with. At times, particularly early on, I tried to push the Direct Market data too far — attempting make it say more than it was able to support. 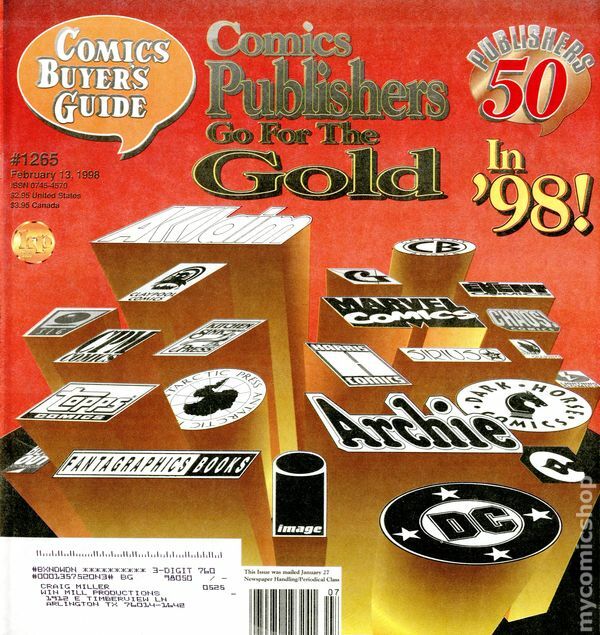 In early 1998, having completed the first full calendar year of monthly reports, I took to Comics Buyer's Guide's annual Publishers Issue in an attempt to construct something of a Fortune 500, ranking the Top 50 publishers by their sales. The problem was that the Diamond data only accounted for preorders within the Direct Market; before 2003, it was not possible to know a publisher's entire dollar sales. It also only reported sales on a few trade paperbacks. Only the Top Sellers were known. Beyond that, nothing was known about sales in the book channel. Every one of the narrow categories we had data for was led by Marvel, but much of what DC was selling was outside what we could see. In the end, I hedged and declared a tie. DC executives at that time were highly critical of the piece, and they had a point. We didn't run the feature again. Another early misstep had come in mid-1998, where I'd seen a plateau amid the market's collapse and reported on it in CBG, wondering if recovery was at hand. It wasn't. I didn't have enough years of data yet to tell what a real turnaround looked like; the market had a ways yet to go before it hit bottom. When things finally began to turn in 2001, I approached it with more caution. And in a larger sense, arguing the tables was kind of pointless as a competitive exercise, because if a publisher really did sell more copies to Diamond than the tables indicated, the Order Index Number meant that every publisher would have sold more. So the rankings of the individual books wouldn't have changed. As time went on, we heard those concerns less frequently. The numbers spoke for themselves, and as time went on and more data was collected, I got a little better at getting out of their way and letting them have their say. I was promoted out of day-to-day work on Comics & Games Retailer in 2003, but I continued to provide my monthly report to the magazine for publication — and then to Comics Buyer's Guide's website, for several years after that. During that time, I left the company to write comics and novels full time, launching Comichron in March 2007 to give my research a permanent online home. The magazines are long gone, but the history has not been lost. All during that time, Diamond has increased the amount of information it's made available. 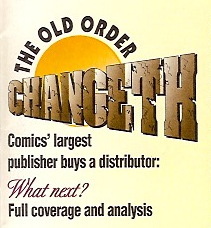 In 1998, responding to DC about the same issues noted above, it began publishing market shares based on what it actually sold, meaning reorders were part of the equation and comics that never shipped weren't. In February 2003, it shifted to reporting the number of copies shipped in its ranking tables, rather than preorders. That put a stop to books making the charts that never came out. And all along, it added to the number of graphic novels it reported sales on, from the Top 10 to the Top 25, then 50, then 100, then finally 300. Comics bestsellers went accidentally to 400 items for a while a couple of years ago, but while I reported those extra titles, I continued to keep 300 as the benchmark grouping. Milton Griepp returned to publishing in the early 2000s with ICV2.com — literally, Internal Correspondence Vol. 2 — and began running estimates. John Mayo of ComicBookPage has also published his own estimates for many years, most recently at Comic Book Resources. We have conversed and compared notes on occasion, particularly when we see some warning flag in the data that suggests accidental misreporting. We all want the information out there to be correct. There has always been, and will continue to be, criticism that the monthly figures do not include this or that portion of the comics market. That is absolutely true, but it is also acknowledged in the fine print on every page — as well as on our FAQ page. I've tried hard not to repeat my early errors of making the numbers say too much; I rely on aggregate changes to a great degree. I've tended not to run trendlines on individual titles, as some analysts have; there's a lot of noise at the individual-issue level, a lot of it caused by the calendar. Two consecutive issues of a title can sell exactly the same number of copies, yet if one issue comes out the first week of the month and the other comes out the last week, the number of copies shipped will appear much different. I did present the figures for that manner in the Standard Catalog of Comic Books, but that was in the context of an attempt to record every fact known about each comic book. I also don't spend a lot of time worrying with the horse race between publishers, although I recognize that is a favored pastime among many. Having survived the 1990s covering the market, I think the important races are with our own past performance; if the industry isn't succeeding in aggregate, "who's winning" isn't that important. I'd also like to talk about what I've observed about the state of the market in that time, but that, too, feels like a different column. In the meantime, I'll be here keeping watch on the data — and feeling, sometimes, like a numbers-geek version of the knight guarding the temple in Indiana Jones and the Last Crusade. The numbers might be just a rusty cup, but they also just might be important. You never know! For now, let me thank you for following these reports — and also all the folks at Diamond and the publishers who've made them possible over the years. Be sure to drop in next month for the September sales report as we're able to publish our first 20-year comparisons in the Diamond Exclusive Era! He is the author of several novels including Star Wars: Kenobi, Overdraft: The Orion Offensive, and Star Wars: A New Dawn, now available in paperback. His trilogy for 2016, Star Trek: Prey, ships in consecutive months in September, October, and November.